Daddy in 1959, 3 years before I was born with my brother and sister. I never remember the date but I always remember the day as the Monday after the first Sunday in October. Twenty three years ago, on this day, my father committed suicide. Our family had just celebrated a big family reunion with my mother’s family, the previous Sunday. This is how and why I associate my father’s death not with a certain date but as “the Monday after the first Sunday in October.” We scheduled the reunion that way so year after year, it would be easy for everyone to remember. In retrospect, everything seemed normal that day but I wonder if there was something I might have missed? If I could take a magnifying glass and review that day in detail, was there something that could have been seen that might have triggered this chain of events ? Or was the timing purely coincidental? In 1992, I was already a grown woman, thirty years old and my still brand spanking new baby boy was just 6 months old. I’ll admit I was distracted by the baby. I had recently returned to work on a part-time basis. My husband received the phone call that day at his work and came to tell me where I worked in nearby Winston-Salem. I remember seeing him walk in my office, smiling at the surprise and thinking “Why are you here?” Then, when he told me what happened, I screamed… “Noooo!” How can you possibly hear that kind of news without screaming? We left, me still shuffling my papers and tending to meaningless details. We stopped by our home before heading to my parent’s house about an hour away on Goat Pasture Road. As we pulled in the driveway, my husband and I were talking about something. It was late afternoon and the sun was sitting low in the sky. For an instant, I “forgot” what had happened to my father; it simply left the forefront of my mind for an instant. I looked up, saw a figure standing in the driveway, silhouetted by the setting sun and I remember thinking “Oh, that’s daddy!” Then reality hit me with a snap. I knew it was the light, the coincidence of my uncle’s posture to my father’s and I knew that my eyes were playing tricks on me. It seemed like a cruel trick and it almost broke my heart for the second time. The last thing I remember about that day was all the people coming in and out of the house. The food. The people. If you were there, most likely I do not remember seeing you. I was sitting on the sofa beside my cousin Patty and I suddenly dropped, I just passed out. This would happen again, several times over the following years and I would learn I have vasovagal syncope, a condition that caused me to faint under certain circumstances. For me, it was brought on by a bent or stooped posture, low blood pressure, dehydration and pain or stress, all of which were probably at work that evening. People always ask this. No, daddy didn’t leave a note and in fact, I don’t recall having quizzed my mom afterwards on what had happened. Surely someone did but I didn’t need to because somehow I knew. My mom and dad did not have good relationship. I am certain they argued that morning before my mom drove off to run errands. I should preface that by clarifying that it was my mom who argued, berated and cursed as was her habit when she was “worked up” and my father had little to say in return which frustrated her even more. This was the script they followed for most of my life and the best reason I swore I would not have a marriage like that. When my mother returned home that day, she found my dad in the car port. He had rigged his shotgun with a straight wooden chair and shot himself in the chest on the exact spot in our two car garage where my mom parked her car. More than anything, the deliberate placement of that chair on that spot seemed out of character for my father. I’ve no doubt, it was a message meant for my mother. Like he had taken all he was going to take from her. She would have rounded the corner to pull the car into the garage and would have seen him, up close with no warning. 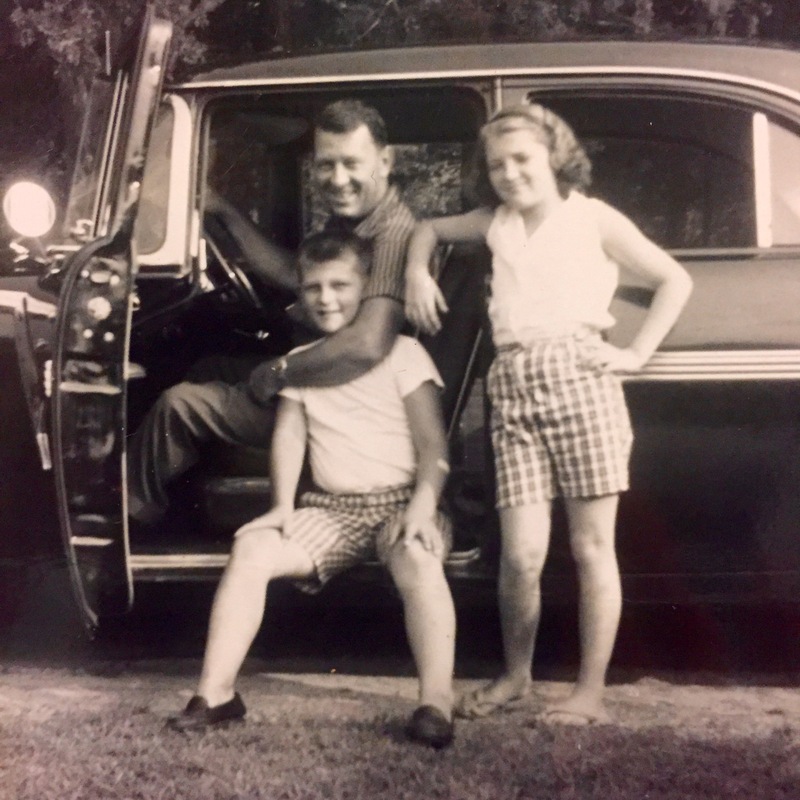 The depression that preceded my father’s death came without warning. Following his retirement a year or so prior, he began suffering to the extent that he told my sister and I about it; together we sought help. My mother did not believe that he was really sick and accused him of being a child, of simply trying to get our “attention”. I imagine she resented that it took a bit away from the “attention” she mandated. The depression seemed unusual because if my father had suffered from it at other times in his life, none of us had ever been aware of it. It seemed to hit him at a later onset than one might imagine someone becoming afflicted with an initial bout of such severe depression. Looking back, after daddy’s death I could see how clearly he’d been depressed and how he wasn’t really “there” most of that last year of his life. He came to visit at my house with mama to see the baby but he wasn’t really present. He was lost in his mind, already gone, had been gone for months. The suicide was the final act. It was closing the door after the lights had been turned off. Over twenty years have passed and I look back on this catastrophe with the perspective of time. There are the “what if’s”… I cannot help but wonder if mental illness did not have such a stigma, might my father have sought help sooner or taken his medications more regularly. I wonder if my parents had divorced like we urged them to do years before, might my dad have had a happier life? Ironically, neither of my parents was ever willing to try separation much less divorce. They seemed to prefer being married to the misery they knew than they were willing to risk looking for the joy of a better life. That says so much about human nature, doesn’t it? About how willing we are to stay miserable before we are willing to assume risk of the unknown. In retrospect, I knew I had tried to help dad and I did not feel guilty about having abandoned him in any way but did I wish I could have done more? Yes, of course. Yet I know for certainty, I saw it first hand, how you cannot help someone who does not want to be helped. Then, there was the simple need to survive. The going through the motions, the putting one foot in front of the other for days, weeks, years… I don’t think I took time to grieve. I told myself I didn’t have time for that. I was a young mother and I had a child to care for, a family, a job, a community and I dug my nails into all those things with as much ferocity as I could muster. On some level, it seemed like if I could be the good wife, the perfect mother, the exemplary employee I could keep the grief from crushing me. I could be and would be a survivor. Whatever got my daddy would not get me. Later, I read a book called The Year of Magical Thinking by Joan Dideon and it reminded me of that time, about the shock. You tell yourself these completely illogical things just to keep going. And lastly, there was the collateral damage this kind of event does to a family that takes years to unfold and can only be accurately seen in a reverse perspective. I think we – my brother and sister, my mother- stayed in shock for years. We were each our own emotional islands, each of us locked in our own form of emotion: grief, shock, denial, anger. You hear about the stages of grief as if they come in an organized, predictable manner but they seemed to hit each of us differently and at random moments. I have a strong family; I am especially close to my sister but nothing really helped the grief but time. Today, this day, the first Monday after the first Sunday, is a special day for me. It is no longer marked with an acute sadness but is a day that becomes more precious with each passing year as my grief has given way to acceptance and then peace. I wish the disease of depression had not blocked dad’s ability to sense the light and love that was coming to him through the darkness. I wish it had not prevented him from being able to see how much he was needed; yet I know firsthand that depression is a dangerous veil that separates us from the world and those we care about. I give thanks for my daddy who was a wonderful, funny, kind, supportive, hard-working and gentle man. I am so glad to have had him as a father and I hope he is proud of me as I am of him. I’ve always heard that the best writers write with a passion that comes straight from the heart, and that they write about what they know. This piece is beautifully written and touching on so many different levels. I applaud you for reaching deep into personal territory that many would consider too rugged and uneven to enter much less invite others to join you there. Thank you Renee. I wish I didn’t know it – and there’s not much “reaching.” It’s just what’s left of me. I was ashamed of it for a long time; I think a lot of people would be… but I think through my words I shine a light and it keeps the darkness at bay. Susan – my heart and soul goes out to you today as the memories come rushing back for you. Your dad was one of my heroes in life…I used to be so envious of how he doted on you and took you places. As I have said previously, I always thought growing up that you had the perfect life with a dad that loved you that much. As you said in your article, we can all learn so much about each other thru reverse perspective. I love you, my precious friend. This is awesome. No one could have said it better. Thank you Nancy. You knew him for many years. I wish I had more years with him. Thank you for your thoughtful insight and ability to share your most private memories in such a way that it provides comfort and peace to all that know depression and see its devastation. Thank you Jenny. Your words mean a lot to me. We are all connected and as long as we can reach out and understand each other, none of us are alone. Take care my friend! You have such a beautiful spirit! He looks like a great Dad, Susan! Thank you Linda. He was very kind and patient. A sweet man whom everyone loved. Beautifully written, my darling Susan. Thank you Kim. We know the depths of each other’s grief. You are a great inspiration to me. Oh Susan, this was so heartbreaking. And Kim is right, beautifully written. Sending love and hugs from LA. “I wish the disease of depression had not blocked dad’s ability to sense the light and love that was coming to him through the darkness.” Oh how I wish that too. Thank you Charlene. I believe that would have made all the difference, and yet as my friend Sharon said, “he’d had enough” . I think that was true. You know… Another story, several years later the three ladies that would later become my best friends and book club buddies went to key west. We did s strange thing for us… We talked to s fortune teller. Lol this was the lady who told me i was a writer 10 years before I even thought about writing. I asked her about daddy and her face lit up so beautifully, she said “he’s so happy you asked about him.” Whether it was real or not, it made me believe he was finally at peace.